An application might function flawlessly when running with a few careful testers who exercise it in the intended manner. However, when a large number of users are introduced, the application is likely to slow down, encounter functionality problems or crash altogether. Applications need to be tested for it s performance in testing conditions. Performance testing is the process of exercising an application with multiple users and verifying whether it functions correctly under anticipated traffic levels, patterns and combinations. Performance testing helps organizations understand how the system will fare in real-life situations in terms of load-related problems which could be anticipated and mitigated. approach towards performance testing is not limited to merely stressing the application. We follow a more comprehensive, end-to-end approach that is targeted at bottleneck identification and performance fine-tuning. We are therefore able to detect bottlenecks right down to the code level and significantly improve an application's scalability often without any hardware upgrades. 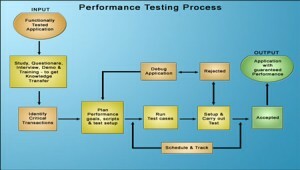 We first identify various parameters that govern the execution of a test run. The test entry and exit criteria are identified and documented. Preliminary test runs are conducted to tune the performance parameters of the various servers (application server, database server and web server) in the architecture. performance solutions provide intelligent virtual users and sophisticated ready-to-run load test scenario’s that realistically simulate user requests. Users can select preset or customize load test scenarios. The solutions do not simply look at the response time and rates delivered for various load scenarios; rather, they run tests that define and measure what problems, in addition slow load times and rates, might occur in different situations. These tests identify load scenarios that can cause problems such as bottlenecks, transactions that are slow or do not execute correctly and pages that are slow or do not load correctly. Our performance testing services will address performance issues in your application, by testing under simulated, realistic user load conditions and common project constraints. Monitor critical indicators so you are quickly aware of any changes to your expected levels of performance.